Good condition. Some scraps and wear of the frame. Chain had some browning, but in good condition. Leather handlebar grips (right hand-grip is damaged with white interior showing). Dome compass mounted on right side of handlebar. Connection point for Trail-A-Bake mounted beneath seat post. U-Lock hostler mounted on left-side of frame above chain. 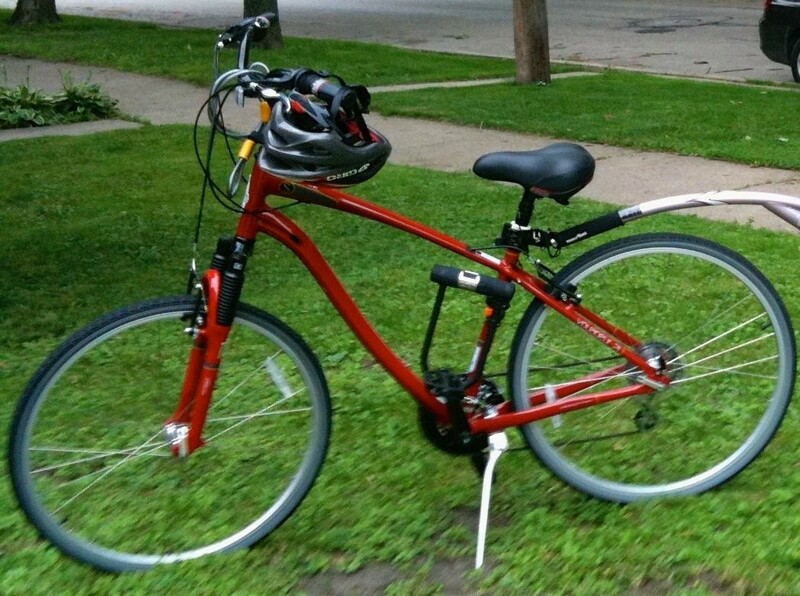 Bike was stolen from the Cumblerland Metra Station in Des Plaines, IL. It was locked to the fence by the station shelter on the Northwest Highway side. The thief either cut the metal cable securing the bike and lock to the fence, or may have been able to unlock the u-lock using the combination code. The proprietors of the restaurant across the street, didn’t remember seeing the bike get stolen. But, there are cameras at the station, so the thief may be on video. The Des Plaines police are investigating.